March 6, 2017 By Elizabeth Lindemann 8 Comments / This post may contain affiliate links. 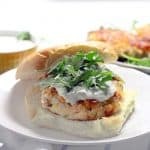 These Salmon Burgers with Lemon Caper Aioli are so easy to make, super moist and delicious, and a healthier, omega-3 packed alternative to a traditional beef burger. They’re also perfect for the Lenten season, whether you’re trying to eat less meat, no meat, or meat-free on Fridays! I made these for Zach and his parents a few weekends ago and, not to brag or anything, but they LOVED them. They were a huge hit. Zach declared them his “new favorite way to eat salmon,” which is a bold statement, since we eat it a lot around here. I’ve made salmon croquettes before with canned salmon, which is already cooked (like tuna). They are delicious, for sure. But these use fresh salmon, chopped up into itty bitty pieces, formed into a patty with some other stuff, and THEN cooked (as you would with ground beef for a regular burger). The result is a super moist, fresh patty with a perfect sear on the outside that holds up perfectly. The best thing about this recipe is you can make it way in advance. You can mix and form the patties up to two days before cooking and keep them in your fridge, or you can freeze them! Just place the formed patties on a baking sheet in your freezer to flash freeze them for about a half an hour. Then, transfer them to a container or bag separated with parchment paper. This will ensure that they maintain their shape and don’t get squished together. Just be sure to defrost them completely before cooking them to ensure even cooking. Similarly, the sauce can be made days in advance of eating. I recommend doubling the sauce recipe and serving homemade sweet potato fries with the meal, using the extra sauce for dipping. 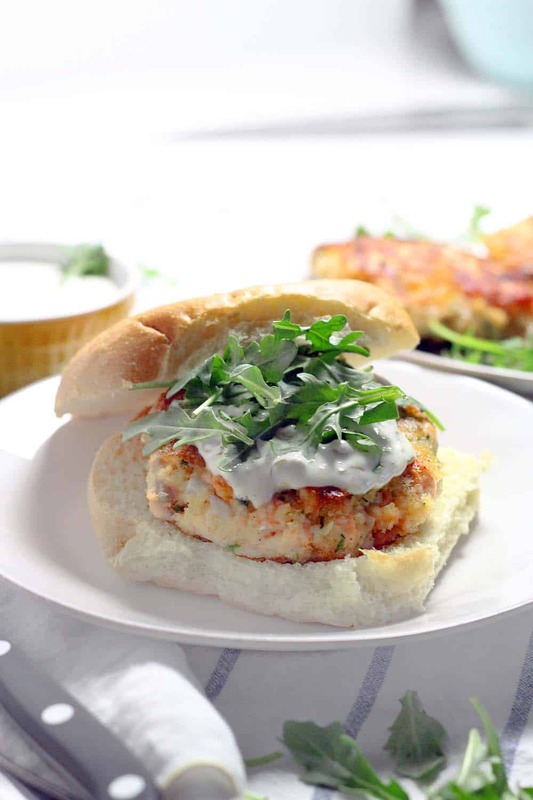 Recipe for Salmon Burgers with Lemon Caper Aioli below! 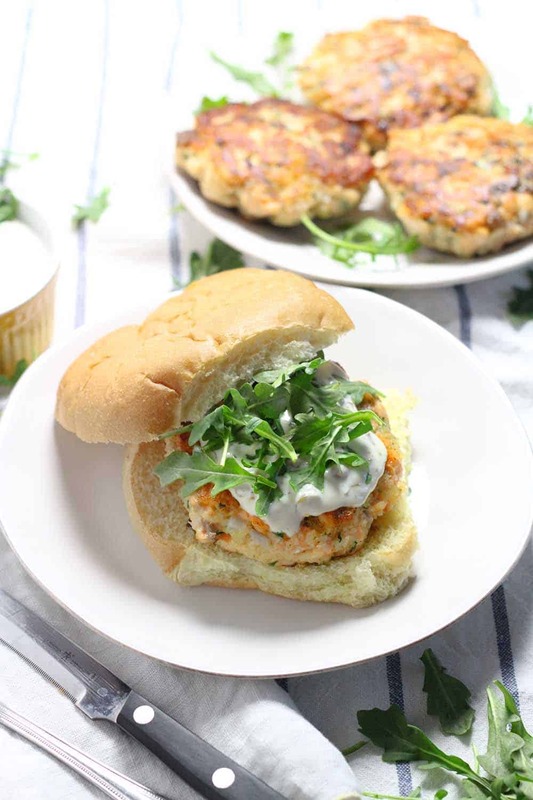 These Salmon Burgers are topped with a Lemon Caper Aioli and are SO easy to make! This recipe is perfect for a healthy alternative to traditional burgers and great for the Lenten season. Chop the salmon roughly into approximately 1/2 inch cubes. Mix chopped salmon in a medium sized bowl with lemon zest, parsley, onion, mayonnaise, salt, and pepper. Start with 1/4 cup bread crumbs and if the mixture seems too wet, add more until you reach the desired consistency. Form the mixture into four equal sized patties. Heat the olive oil in a heavy skillet (such as a cast iron skillet) to medium high heat. Sear the patties on one side for approximately 4 minutes. Flip and cook for another 4 minutes, or until salmon is cooked through. Meanwhile, mix the ingredients for the lemon caper aioli in a small bowl. Serve the patties on toasted burger buns topped with aioli and arugula. For a lower-carb version, omit the bun and serve on lettuce wraps or on top of a bed of greens drizzled with the sauce. Hey there! Do you think the recipe still works if I leave out the breadcrumbs? I love this recipe but trying to see if i can make it Whole30 compliant. Thanks! Great recipe. I added dill to this batch. I double the recipe Do you recommend freezing before it is cooked or after? Sorry for the delayed response! Love the idea of adding dill. I think in an ideal world, freezing them before cooking would be best. Then, make sure you defrost completely before cooking. Freezing them cooked would work, but since it’s easy to overcook salmon, the result might be a bit dryer than it would be otherwise. Hope that helps! Delicious. Made them twice and they are a crowd pleaser. Any idea on the calorie per burger? So happy you liked them! Sorry for the delayed response. I’m in the (slow and tedious) process of updating my old recipes to have nutritional information. I went ahead and updated this one thanks to your inquiry! Looks like, WITH the bun and sauce, each burger has about 601 calories. hope that helps! I love your recipes! I wish that your comments before the “recipe” box, the ‘filed under and tagged’ lines could be copied. 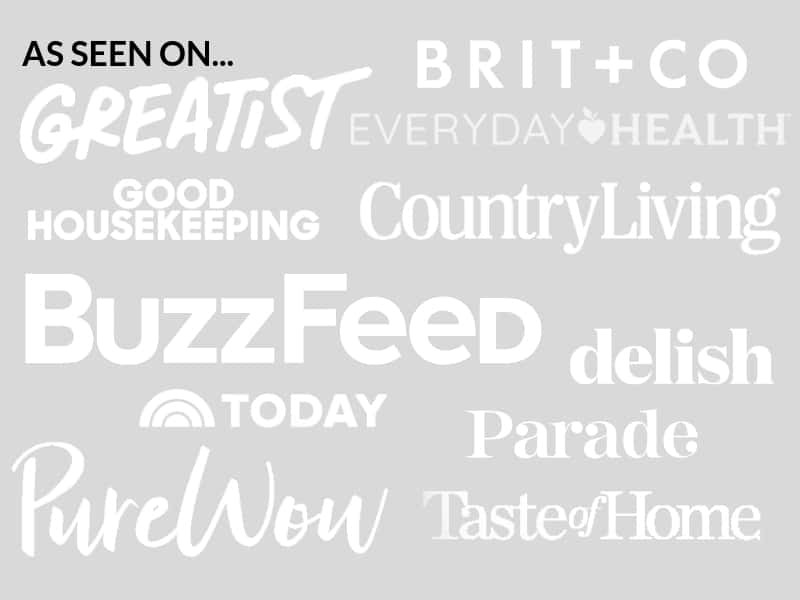 I was able to do it on some of your recipes, but, not all. Thanks Terry! Hm, I’m not sure why you were able to do it with some and not others. Sorry about that! If you have trouble copying them but want to print, I would suggest printing directly from the internet browser rather than pressing “print” on the recipe card, since the entire blog page should show up. Hope that helps!